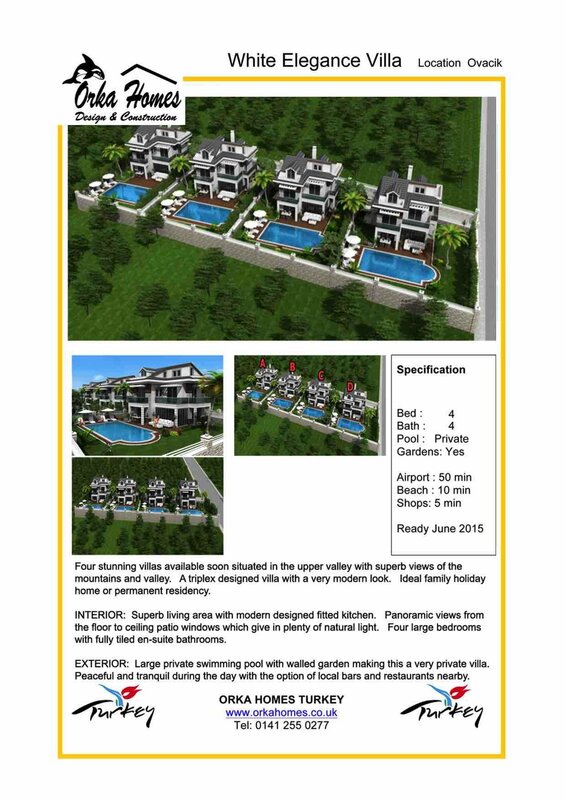 Modern villas in Turkey for sale over 3 levels giving you wonderful views over the Ovacik valley. The Four Seasons is the same villa style but a different location in Ovacik. This villa also has a huge basement which could easily be converted into an apartment with two separate bedrooms, lounge and bathroom. Could be used as a separate property or as an addition to the main property accommodation. Open plan living downstairs with your own private swimming pool and private gardens. Huge Basement which could easily be made into more bedrooms. Upstairs you will find 4 double en-suite bedrooms with terraces surrounding the property. A great sized villa which would suit either as a holiday home or for permanent living. Although the villa is in a slightly higher location and a car would be of benefit there is a local taxi position just across the road from the villas. The local city of Fethiye is only a 10 minute bus ride away and the local shops , bars and restaurants are all only 5 minutes away in a taxi. Overall this is a lovely villa in a great location and well worth a look when you are searching for villas in Turkey for Sale. Viewing trips are recommended and available to view properties of your choice.